Every day we have tons of paper sent to us in the mail, boxes that our food is packaged in and in my case, lots of beer packaging. In this video I show you how to turn all that paper into something very useful, a way to heat your home for free. To do this you will need a bucket, a drill and a whole lot of paper. The video explains the process of how to turn paper into a paper log that will burn for hours and keep your house warm. Start making the firewood in late spring / early summer and continue throughout the summer. By the end of summer, you should have quite a supply to use over the following winter.No more junk mail to throw away, free fuel source, and no way for one’s identity to be stolen via thrown out mail. Also, burning junk mail will save the amount of firewood that needs to be burned. Fewer trees burned equals happier planet! Although, this sure is a backwards way to burn trees and we look forward to the day there is not more junk mail. 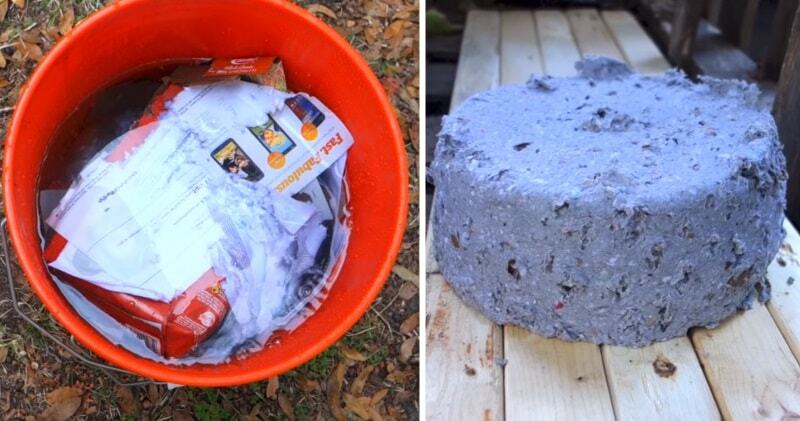 The dyes and chemicals used in junk mail and other paper are very toxic when burned. They can harm the environment.Do not cook over this fuel source. Also, it can cause chimney problems. Make sure to perform biannual chimney checks and cleanings.